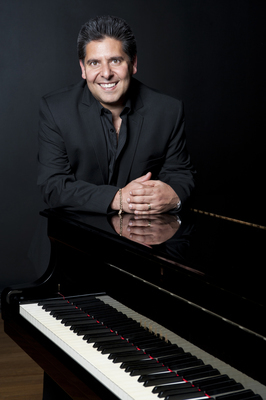 VIRTUOSO: Master pianist Joey Fimmano comes to Geelong next weekend. Joey Fimmano was just four when his grandfather’s love of music inspired him to pick up the piano accordion for the first time. “He was my grand inspiration, right up until he passed away,” the 55-year-old told the Indy this week. While his grandfather favoured the guitar or mandolin, his passion began Fimmano’s road to playing piano on Young Talent Time and across Australia and the world. The renowned pianist brings that passion to Geelong next weekend when he plays his favourite music theatre tunes alongside three talented singers. Joining him on stage at Geelong Performing Arts Centre (GPAC) are soprano Jessica Di Bartolo, tenor Gaetano Bonfante and musical theatre performer Dexter Villa. “It’s a really lovely team and we get to do all the songs we want to do,” he said. Growing up in Italian migrant family, the accordion was a natural first choice, Fimmano said. He moved onto piano lessons and soon scored a gig on Young Talent Time at age 11, about the same time Tina Arena appeared on the show. “I think the early years doing the TV shows was an eye-opener,” he said. His dad, now 87, worked in the building industry but lived vicariously through Fimmano’s music, he said. “(My parents) just had to earn money and live, so they sort of missed out on the opportunity,” he said. Fimmano has played in shows across the world and now regularly has gigs on cruise ships. “It’s just lovely. Without being corny, you’ve got great captive audiences that are there to hear you and have a good time,” he said. The musical genes appear to have passed on to his Fimmano’s eldest son at age 4, like his father. “He likes drumming of all things, I’ve tried to encourage him to play a bit of piano,” he laughed. Fimmano will play Andrew Lloyd Webber’s hits and other music theatre classics when he brings his show Music of the Night to GPAC on 23 February.